Usually, a video size converter is high-sounding so consumers believe that this application has powerful features that it clearly doesn't and most of the time isn't anything like they lead you to believe. Take Handbrake for instance. When you google " video size reducer" or "convert video to smaller size without losing quality", Google will show you the top results, among which two YouTube videos titled "How To Reduce a Video File Size By Over 90%! Without Losing Quality" will definitely draw you attention. You can't help wondering if this free video size converter can really shrink file size up to 90%. I have the same feeling with you. Hence, I watch the 2013 uploaded YouTube video and get the operating steps. I use the method it tells to have a test in Handbrake 1.0.1 on my iMac (Yosemite). The result shows that I can only compress MKV (AVC) video to MP4 (H264) from 89.4 MB to 78.7MB with little quality loss. That's a big gap between propagation slogan and real test result. If Handbrake can really reduce video size up to 90%, my output file should be 8.94MB. So until now, do you still believe the advertisement? In case you plan to change a video compressor, here recommends you a genuine application, which is 100% exactly what it claims or better. 1. Compress MP4, 4K UHD, MOV, MKV, AVI, etc. almost any video to HEVC (H265), H264, MPEG-4, VP8, VP9, XviD, DviX, etc. 180+ video format with codec change to reduce video file size, up to 50% size reduction (esp for HEVC), virtually no quality loss. 2. Reduce video file size via parameters adjustment like lower resolution, bit rate, frame rate, etc. to make video up to 40-50% smaller. Of course, certain video quality is sacrificed. 3. Downsize video by editing video file, including trim feature to remove unnecessary parts from video, crop feature to cut off black borders from video image, etc. This doesn't damage any video quality to compress video size, with 10% - 90% compression ratio based on your own needs. 4. To make a good balance between file size and output quality, you can combine the above mentioned methods together to reduce a video file size, change video format (codec), properly adjust parameters and edit video, which will produce a smaller-sized file with excellent quality, up to 70% file size reduction. Directly compress video to all the latest iOS iPhone iPad Android device. Free edit video (crop, trim, etc.) and adjust parameters to downsize video. What is the Best Video Compression Format for Your Usage? The current market is filled to brim with numerous digital formats and codecs. If you can use the right video formats in different situations, you can just skip this part. If not, you're suggested to spend a few mins here to supplement the relevant knowledge. 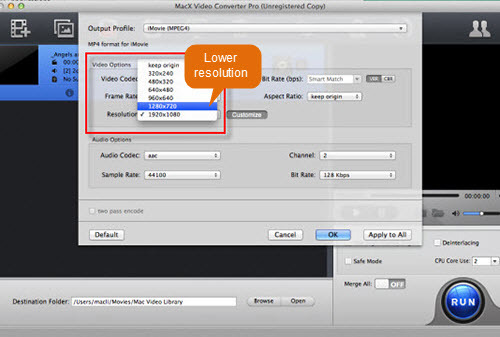 Instead of the boring yet elusive words explanation, here we use this MacX video size reducer to compress MP4 (AVC) video on 27-inch iMac (Yosemite) with 2.7GHz Intel Core i5 to see which video compression format/codec is the best for Email/Gmail, YouTube/FB uploading or mobile devices with a view to both file size and output quality. This test is just to compress video to different video formats without any parameter settings adjustment or video editing. Building on the above data, we can see if you wanna use video size converter to reduce video file for mobile device (Android/iOS), you're suggested to consider MP4(H264), MP4 (HEVC), MOV (H264) and MKV, for they do a great job in file size reduction and output quality, as well as video compatibility. Supposing file size is the key, 3GP and WMV (wmv2) are your primary choices. As for video uploading or E-mail/Gmail, you can't miss MP4 (H264) or WMV. After all, the video quality you should still pay much attention to. So far, if you still think the output file size is too large, you can further edit video with this video size reducer. And seemingly, it works quite well. To dramatically shrink video file size, you should convert video to another format (codec), along with video editing and parameter adjustment. All these work together to produce an output file size with up to 70% size reduction and insignificant quality loss. Import video via "Add Video" button or just drag and drop video files into this video compression software. As we have already mentioned, MP4 (HEVC) is the ideal format for your iOS 11 iPhone X - iPhone 5s and most flagship Android devices like Galaxy Note 8/S8, Huawei Mate 9/10, LG G6, Sony Xperia XZ series, Xiaomi Mi 6, etc. And MP4 (H264) is also a nice choice for most mobile devices and platforms. So, you're suggested to choose MP4 (H265) or MP4 (H264) from "Mac General Video". If you need to even smaller-sized format, go to "PC General Video" to choose WMV or 3GP. Step 3: Shrink Video Now. Click "RUN" and this video size reducer will begin to convert video to smaller-sized format (codec). You can select multi-core CPU utility to assign more CPU cores to speed up this video compression task if your video file is large in size. If your computer supports Intel QSV hardware acceleration, that would be even better. This Intel QSV supported video compressor can activate your PC's Intel QSV and super fast reduce video size at 250-300 FPS. This method is more suitable for HD video or Ultra HD video compression like 8K to 4K, 4K to 1080p, 1080p to 720p, etc. If you have such demand, stay here. Press "Add Video" button to import video files. Batch video compression is also supported by this top video size converter. Tap "Settings" option to adjust video parameters like resolution, frame rate, bit rate, aspect ratio, etc. Generally, to lower bit rate, you'd better turn down bit rate to 20-25% compared with its default one. Still hit "RUN" button to begin reducing video file size. The whole video compression procedure only consumes a small part of your CPU, so you just leave it alone and continue your other tasks. Drag video files to this video size converter or import files from the first button on the main interface. Click the scissor-shaped icon to enter the video editing zone, where you can split video, crop video, add/remove subtitles, rotate video, etc. # To trim video, tick "Enabling Trimming" and then put your mouse to the Start Time to free set the beginning time via numbers or the moving slider. The same method applies to set the End Time. # To crop video, choose "Crop & Expand" and then tick "Enable Crop". Similarly, you're allowed to directly drag the marquee to adjust video image size or fill numbers in "Position" and "Size". Press "RUN" button to resize video and then leave the rest to this video size reducer. You can just rest. You can utilize video conversion, parameter adjustment and video editing together to vastly reduce the size of video and also keep output quality as good as possible. I really have a hard time reducing file sizes. I have hundreds of videos, and now I'm losing space on my Samsung Galaxy S6 Edge phone and just don't want to delete videos for sentimentality. As much as I want to consider reducing resolution, reducing sound quality, reducing fps and anything that amounts to reducing quality, I can not do so as I want to know. hoping that professionals will be able to direct me to a solution. Answer: Actually, it's dead easy to reduce file size by lowering resolution, sound quality, frame rate, etc. 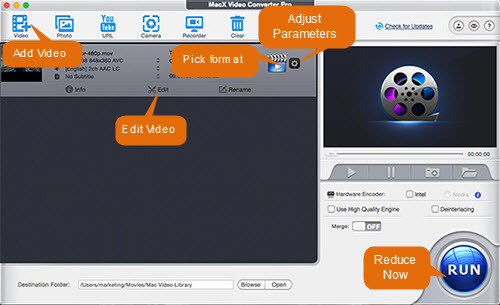 You can consider the video size converter from MacXDVD, which lets you lower resolution, frame rate, bit rate, aspect ratio, audio codec, channel, sample rate, etc. from the preset options, needless of any manual settings. Need suggestions for best video compressor for Android? Somebody knows of an Android video converter or Android video size reducer, or something else, to reduce a large video to something smaller that my Samsung phone can accept without eating much space? Answer: You can try Video Compressor on your Android, since this video size converter app wins 5-star good reviews from 48.95% users among 5408 in total. They say this is a simple yet outstanding app to let you compress a 1.1G video under 15MB. Meanwhile, its quality also keeps well. So, you can download to have a try. My question is.....the movie is approximately 2 hours long and about 7gb in mp4 format. How do I compress it online without losing too much quality so I can online stream it? Answer: The reliable online video compressor that is worth a mention is clipchamp. This online video compression service provides you with a simple yet fast way to compress and convert video on Mac/Windows. After you free sign up this website, import video file, pick the preset output and then wait for the compressed files. That's all. Nothing complicated needs you to handle. That's why this online video size reducer attracts 1.8 million users since January, 2016. Video too large to email. Hi Guys, Coming from an iPhone 6 when i recorded a 1080p video clip I could send it via gmail and if it were too long it gave an option to trim then I could send it no problems. Anyone with a solution to this ?? Answer: To trim video and reduce file size, Video Slimmer might help you. This video size converter app enables you to remove unwanted parts from video to trim it and also to customize video via adjusting video dimensions (width/height), video file size, quality, various optimized presets to further compress a video to 80% size off. It sounds great. Have a try if you have no other plan. MacX Video Converter Pro - 4 solutions for you to convert video size and compress MP4, 4K UHD, MOV, MKV, AVI, etc. almost any video to 180+ video format with codec change to reduce video file size at 10 - 90% compression ratio. Of course, the quality loss depends on your solution. A guide about how to compress mov files with no quality loss.